We have received some inquiries regarding this campaign’s tier structure and upgrade options, and would like to address some of the most frequently asked questions. The most common question asked is about our ability to offer existing and new customers fast delivery at a higher price. We make these offers in limited quantities from time to time as a promotion and only when the numbers show it will have zero to negative impact on the overall timetable. These new funds are used solely to further our mission to give you the best possible products and deliver them as soon as possible. Literally 100% of our margin is reinvested into the company to improve the processes including, but not limited to, hiring new workers for the Crane lines, improving customer and technical support, subsidizing product improvements (such as the recently announced UnBound printbed sheet upgrade that you will be receiving free of charge), not up-charging on the additional duties incurred due to the US-China trade changes, adding new management structures, putting in place additional quality control processes, and working on better repair/warranty/RMA offerings, all of which have very significant costs. Additionally, the more users participate in the Crane project, the more aggregate knowledge, refinement, tech support, and success everyone (including yourself) will have. Thus any new sales and funds we receive allow us to speed up the timetable and improve the overall quality of your experience, despite us adding a few extra spots to the shipping queue. We understand that these facts may not be immediately obvious which is why we wanted to ask you to kindly consider them when you comment or engage with other users and community members. Everyone has a different skill level and experiences with 3D printing, and we want to encourage you to be kind and welcoming to all members of the M3D family, new and old. We are all in this together and very much appreciate those who recognize the extreme effort and complex strategies that go into making new products as a small local business competing on a global scale. Now that the QuadFusion and Cranes are in the hands of about 500 users combined, this is a good time to reflect on how we have taken great risks and created some amazing relationships to impact the worlds of Open Source and 3D Printing to make color a possibility. Before the QuadFusion printhead was available, very few software, firmware, or electronics options existed for color 3D printing - that’s because there was no standard platform for color-mixing that developers could even try to write the code for. These things are still in development, however they have come a long way if we look back over the last few months. Thanks to the great team at Voxelizer and feedback & support from community members like you, software focusing on the Crane Quad 3D printer (as well as dozens of updates) have gone out, allowing the Crane to become the first open source compatible platform that has access to relatively inexpensive advanced software for color-mixing. There are of course numerous other developments worth mentioning, including the Duet Maestro, RepRapFirmware, color-calibrated mixing filaments, user scripts, custom slicer add-ons, and other influencers in the industry working together and in parallel to make 2019 the year of color 3D printing. We’ll cover these in future updates, but in the meantime we encourage you to remember that open source systems can only be improved with feedback and follow-through by the community to improve those systems. We would also like to ask that when you receive and enjoy your printers, please spread the word about the innovation that went into the Crane Quad and QuadFusion technology, and help us get more people to join in on the cause and better it. At least for the entire remainder of 2019, 100% of proceeds from sales will continue going into improving M3D’s operations and giving back to the 3D printing and open source communities as a whole in the form of better innovative products, support, and documentation contributions. Like many tech leaders, M3D realizes this and is ready to make no profit for years to come in furtherance of leadership and innovation in the industry. What we do is a labor of love, and we see huge possibilities building on these achievements in the future. Last but not least, March is our birthday month (M3D is turning 6!) and we have been treating customers to weekly deals on different products. If you have already received your Crane 3D printer and have a friend or colleague that just won’t quit asking to borrow it, we would like to extend you a friends & family discount code to share - they can use an “EAGER_ADOPTER” coupon code to save $225 off the $999 Eager Enthusiast Crane Quad at store.printm3d.com. Have them join in on the fun and celebrate with us! As an added bonus, you will have a 3D printing buddy with a Crane Quad and can help each other learn the new machine together ;) This offer will be active until April 7th, 2019 or while supplies last. Very limited quantities available. Thank you as always for your continued support and interest in our products. Our M3D team is going through some important restructuring and reorganization internally and this has slightly affected some operations and timelines. We would appreciate that while you wait, you recognize that your contribution and our push to make this hardware is essentially creating a brand new industry. Our journey started when software like Voxelizer did not have a machine like the Crane Quad, and we successfully (with your support), took on the risk to develop global partnerships (with Duet3D for electronics in the UK, Voxelizer for software in Poland, production for parts in China, and design/final assembly/QC in the USA) to enable users and developers alike. In the effort to help build and deliver your rewards faster, we chose to heavily shift technical support team members to help with production and quality control processes. This was a very popular suggestion among backers in the excitement to receive their order sooner (and we totally understand!). We also decided to restructure our customer support process and are looking into the possibility of outsourcing this portion of our operations to service centers. While the team is figuring out the logistics of such change, we ask for your patience with any outstanding tech inquiries or RMA requests. While we are figuring out a support solution that would improve user experience and response times for all Crane backers, everyone who already got a printer will receive 3 extra warranty months free of charge so that time does not count against your existing coverage. This will be recorded on our end with accordance to each printer’s serial number and no further action is needed from you. By the time Batch 3 users receive their Crane 3D printers, we expect to have a streamlined servicing solution in place. We are also preparing a very extensive troubleshooting self-help chart to help you learn the Crane at your own pace in the meantime. Our standard manufacturer’s warranty starts on the day that your backer order is delivered and lasts 3 months. Additional warranty options are available for purchase during the FitForLaunch checkout process or from our main store. Upgrade to the Eager Enthusiast batch and have your order shipped within 1 week, pending that all items are in stock. To make this option more affordable, we have lowered the Eager Enthusiast upgrade price to $199 until March 31st, 2019 only. No matter which batch you have already purchased, as an existing backer you can receive your printer now at a lower total price than you would by purchasing the Eager Enthusiast version directly. This is the only way we are able to give select Crane orders priority while keeping in line with M3D’s launch policy of offering the lowest prices to those willing to wait longer. Look for “Complete Order” or “Add Items” button. You can continue to add items and purchasing upgrades until your order is ready to ship. If you have any questions or need help with your backer checkout, please send us an email to checkouts@printm3d.com. Thank you for your continued support towards M3D. We would like to reassure you again that our team is working diligently to get all of your orders fulfilled as quickly as possible and find a support solution that will be able to provide you better and faster help. If you can think of any particular technical service provider or a 3D printing shop in your area, please drop us a note at https://store.printm3d.com/pages/contact and we will look into the possibility of working with them. For example, we've seen a couple of users having difficulties with the setup of their 3D printer when they simply didn't read the instructions telling them to install the SD card into the SD card slot prior to getting started. The Crane series of printers are unique in that they are built with a Duet 2 Maestro board. The Duet board uses the information on the SD card to operate, in a sense the SD card that goes in the slot on the Duet acts like its hard drive. Please take a few minutes to read the instructions, we cannot emphasize their importance enough. Thank you, and we look forward to seeing what you will create! Stay tuned for a print contest and user reviews in the coming months! This update is dedicated to those of you who are waiting for your Crane Quad 3D printers. We will be posting another update in a few weeks that highlights software, instructions, and our upcoming print contest for existing Crane users as more and more backers receive their units. Manufacturing: Over the last few months, we have been receiving more orders than we expected. In order to help speed up our assembly times, we will be utilizing more partner locations to prepare the parts and sub-assemblies for your printers. This should allow us to deliver your Cranes faster. Final assembly, QC & tuning will still be done by our main production team. The best news? All existing unfulfilled Crane 3D printer shipments will be upgraded to come with the UnBound™ glass fiber print sheet instead of the regular sheet FREE OF CHARGE as a thank you for your patience with the wait! "Is anything wrong with the standard black print sheets you were using before?" - Nothing as far as getting high quality prints, however we found the UnBound™ glass fiber to be more resilient to nozzle damage, longer lasting, easier for print removal and overall a better printing experience. The print quality is unaffected. "Does this mean the glass bed is now obsolete?" - Not at all, glass still a top-notch standard for high rates of production and customization of interface glues. It has almost indefinite longevity and can produce mirror-finish bottoms. It's also the best choice for higher temperature printing (I.e.HIPS). Glass print beds have a higher learning curve, but are not invalidated by the UnBound™ in any way. 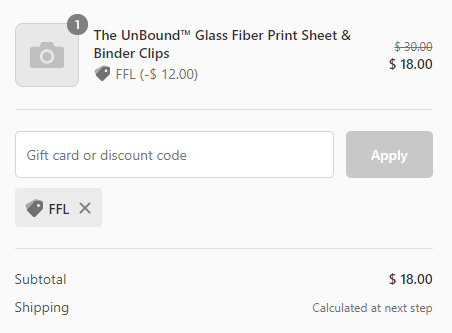 If you ordered a glass bed during the checkout, you will still get the UnBound™ sheet with your Crane to try it out. "I have already received my Crane, where can I purchase the new printbed sheet?" - If you would like to purchase the UnBound™ for your existing Crane 3D printer, these print sheets are now in stock on our website at https://store.printm3d.com/products/unbound-glass-fiber-sheet. Backers who have already received their Cranes are eligible for a special discounted price of $18 (reg. $30) when they use a discount code: FFL during the checkout process at store.printm3d.com now through January 31st. Some Batch 3, 4 & Market Ready backers have already been invited to complete their final checkouts in the FitForLaunch system, and others can expect their invites soon. This is done so we can estimate demand for parts and filaments, and have them in stock when your order is due to ship. We encourage everyone to keep their shipping addresses and add-on selections as complete and up-to-date as possible to avoid processing delays. If you are looking for steps required to complete your order, please refer to our previous update. Thank you for your continued support! We hope 2019 has been treating you well so far! November Update: Eager Enthusiast & Batch 1 Printers Are Now Shipping! As some of you are starting to receive and complete the final checkout, verifying your shipping addresses and choice of add-ons, we were able to compile a list of the most popular questions which will be addressed in this update. Look for “Complete Order” button. It will change to “Add Items” once your shipping payment is completed. You can continue to Add Items until your order is ready to ship. Please note: Checkout invitations are being sent out in batches and not everyone receives them at the same time, so we appreciate your patience in awaiting the invitation email. If you have not received a checkout invitation yet, we will continue sending them out to other backer tiers later this month as earlier orders get fulfilled. We are now shipping Eager Enthusiast and Batch 1 Crane 3D printers. The main factors that affect your place in the queue are batch number, order date, checkout date, and preferences selected during checkout. We are unable to provide individual shipping times beyond estimated shipping start dates from the previous update, but we are working on getting everyone their printers the soonest we can. Shipping has started according to the timeline provided in the previous update (please note that months denote the start of shipping only, actual shipping times are a range and will continue throughout the coming months). If you have already completed the final checkout and can no longer see the “Add Items” button - congratulations! Your checkout has been disabled and your order is now undergoing quality control and packaging. It will be on the way to you within 1-2 weeks and you can keep an eye on your inbox for your shipping notification and tracking number. Due to a high volume of orders, the average wait time between checkout and shipping currently varies between 2-8 weeks for Batch 1 and Eager Enthusiast backers. Other batches are not shipping yet and we will update you here when they are ready. Please be patient and make sure that your information (such as shipping address and add-ons) is up-to-date and accurate at all times. The hardware, as well as software/firmware and configuration of all three Crane models (Bowden, Dual and Quad) has been finalized and will remain the same going forward. 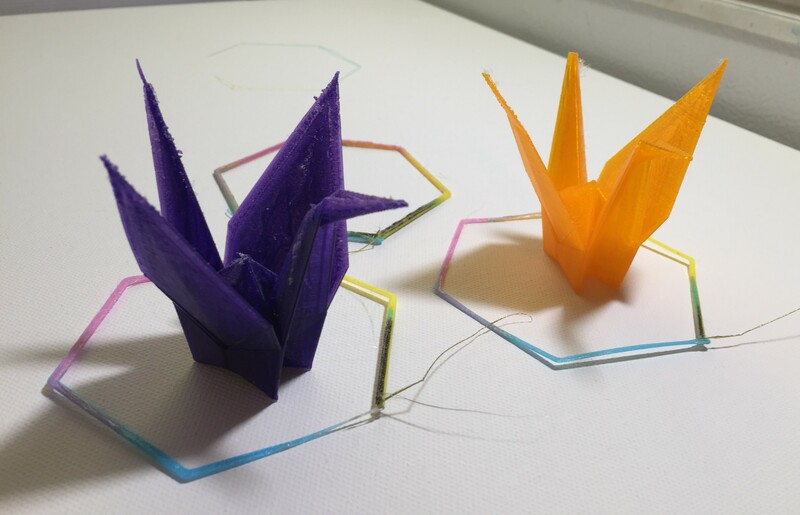 Demonstration prints: things like the Origami Crane (included below). One of the Crane Quad test prints has already been implemented to use our signature color skirt to showcase your printer’s capability. We've also included utility functions specific to loading/unloading filament on the Cranes. Our documentation has been vastly updated and customers will also be able to submit their own print profiles from various slicers. As some of you may have heard, M3D is finalizing a partnership with Voxelizer, a 3D printing software that we found to work best with the QuadFusion extruder and Crane Quad 3D printer. This has allowed us to do color prints with very simple and straightforward methods, and we wanted to make it accessible to our users. We were able to make an arrangement so that all M3D users will receive a free 2-month software license. We are in talks regarding the possibility of increasing the free trial to 3 months, but that is currently not a guarantee. You can use the following form to register your interest in using the Beta version of Voxelizer: https://voxelizer.com/compatibility. The Voxelizer team will be sending the invitations to people who express interest through the form. The software is still beta, so you may experience some difficulties. While access to this beta license is free, it is important to note that the final software will need to be purchased. To provide users more options not requiring the purchase of new software, we'll be making some final updates to a free community-created post-processing Cura plugin that can handle color similar to Voxelizer. User Prints As you receive your 3D printers, we highly encourage everyone to share what you create by posting photos to Discord, Instagram, or even sending them to us at hello@printm3d.com. With Cranes, and especially Quads, being such a new 3D printer series and concept, we look forward to building an active community of users and appreciate everyone sharing their experiences. (And we’re always happy to share your work and give you a shoutout on our social media, so please do not hesitate posting your creations!) As we receive your photos, we will be building a gallery of user prints on our website. WARRANTY: Standard manufacturer warranty has been applied to your 3D printer automatically. Extended warranty options are available at store.printm3d.com. Hope you all had a great summer! As we are all getting ready to enjoy the onset of Autumn and everything that comes with it, we are also getting ready to ship out your Cranes! Read on for more updates. We have finished setting up our assembly line and begun assembling the first Cranes! We have all the parts for the first batches of the Cranes, and will begin with Bowden’s then move on to Duals & Quads. See below for some pictures of our assembly line and manufacturing process. We do not want to have a beta launch, so we are working towards making sure we have the proper user flow and instruction guides to ensure all of our users begin with a solid foundation of aggregate knowledge. Our number one goal is that when your Crane lands you have the ability to select a gcode file, hit print, and get an immediate impressive success, so you have confidence in the printer and can then work with us to get out your dream prints, knowing the machine is fully capable. This is especially important for Crane Quad users, since it is a new technology with unique properties, technical guides must be followed for success. We want to ensure that you have a smooth and positive user experience, so we are dedicating a lot of time to creating a really robust and thorough collection of user guides. You will be able to access them here: https://crane.printm3d.com/. Based on initial testing and feedback, we have made a few changes to our quad printhead: we made small hardware tweaks with the fan, and made the fan holders stronger and angled them inward for more symmetrical fan cooling over the print. Above all, we also noticed an issue where fan blades were breaking and getting in the way of changing your nozzle, so we moved the fan from the front to the back in order to correct this. Left - The updated front side of the QuadFusion head. Right - The updated back side of the QuadFusion head, the fan is internally ducted. We have been very busy testing the Cranes to put together a process for color 3D printing, and are very excited by the results! See below for some of our most recent prints. In these timelapses, you can see the Crane Quad demonstrating some of its unique features: In the fish timelapse, the print head switches from one color filament to another, and in the frog timelapse, the QuadFusion is mixing different CMYK filaments together to create new colors! We will be sending out a final checkout email to all of you soon where you will be able to verify your shipping address, pay for shipping, and add accessories or add-ons (such as glass beds and filament) to your order. 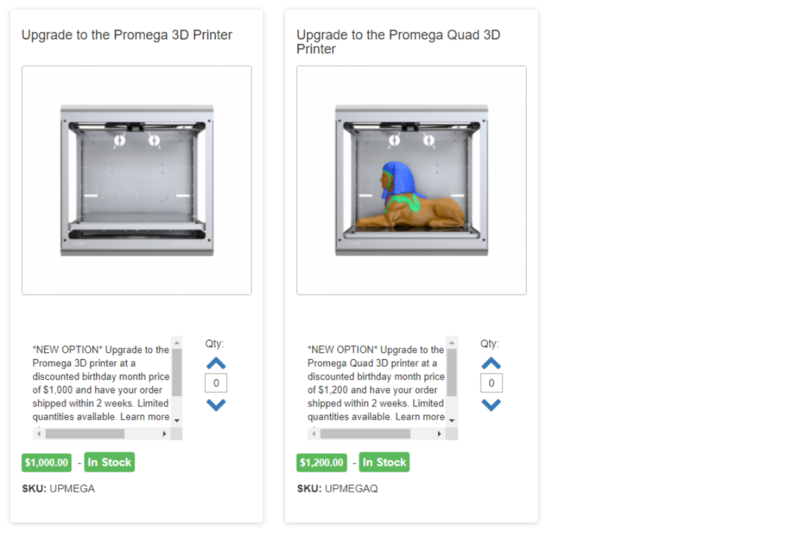 You will also have the ability to upgrade your printer if you originally pre-ordered one version but now want to change it, or to add a second printer to your order. Upon receiving our email invitation to final checkouts, please login to your FitForLaunch account (link to https://fitforlaunch.com/login), go to “My Contributions,” and “Complete Order.” Checkout invitations will be sent out in batches and not everyone will receive them at the same time, so we appreciate your patience in awaiting the invitation. We already have the parts for the first batch of Bowdens Duals & Quads, and the second batch of Bowdens. Parts for Bowden batch 3 and Dual batch 2 are on their way to us. Parts for Quad batch 2 and Dual batch 3 should ship out to us in October, parts for Bowden batch 4 should ship out to us in November, and parts for Quad batch 3 and Dual batch 4 should ship out to us in December. We estimate to begin shipping Bowden batch 1 in September, to begin shipping Bowden batch 2, Dual batch 1 and Quad batch 1 in October, to begin shipping Bowden batch 3 and Dual batch 2 in November, and to begin shipping Dual batch 3 and Quad batch 2 in December. We wanted to wait before providing an estimated timeline for deliveries after December. If you do not see your batch on this timeline it should ship out in January or February of 2019. We apologize for not updating you on the shipping timeline sooner. As a small company with limited resources we chose to dedicate all possible manpower to focusing on product quality, putting many hours of testing and refinement into each unit so that you have the best quality at the best price. Product affordability and accessibility has always been one of M3D’s main goals, so far no competitor has been able to match or beat us on that despite having more resources and bigger R&D budgets - so we thank you once again for your patience in awaiting the delivery and putting your faith in the Crane 3D printer! Thank you again for backing this project and for taking the time to read this update. Keep an eye out for the checkout email which will be coming your way soon, and stay updated in our discord channel! We would like to share a time lapse of the Crane Quad. Enjoy! We'll be holding more of these live Q&A sessions throughout the campaign. If you're not already subscribed, be sure to join our email list and get a heads up on everything going on with us and this campaign (scroll to the bottom of this page). Talk soon! What An Exciting Couple of Weeks! The Crane debuted last week and was met with a lot of excitement and curiosity. Many realize the potential of the Crane. Whether it’s a high quality, base Crane Bowden with a reputable Duet control board for an incredible price point, a Crane Dual with added features or access to the future of 3D printing with the Crane Quad, the Crane series of 3D printers is opening up a lot of conversation and investigation into the greater capabilities of 3D printing, especially at this sub-$1K price point. One such example are the possibilities around a 3D printer such as the Crane Quad. 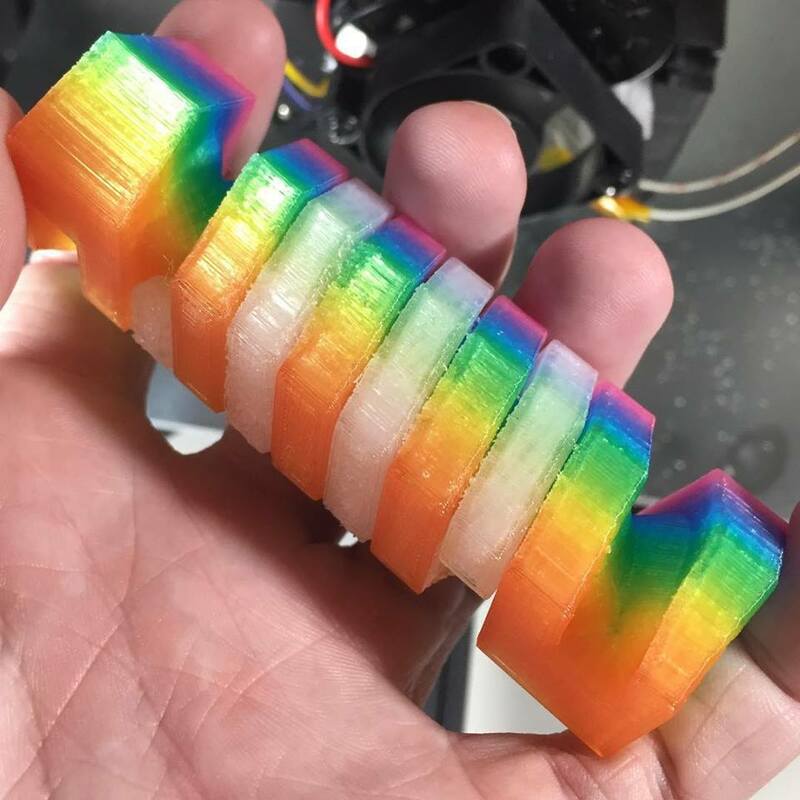 We all know by now that the QuadFusion extruder head can mix filament together to create color. The prints on the launch page illustrate the ability to create colors on the fly and create gradient prints. Which, that alone and and of itself is a novel perspective for 3D printing. Since the introduction of the Crane Quad, we have been asked if it can achieve the more difficult tasks to print multiple colors on a single layer, as well as the ability to do spot color. Our response to questions like these is a resounding YES. Through model slicing, this is absolutely possible. We recently started a project which applies and mixes several colors on one layer. It’s in an early stage and is something we’re really excited to prove is possible and will be refining further. Exciting stuff, right? With our lowest tier closing out soon, we’ve prepared another way to get a Crane 3D printer for a great deal. In the words of the Beatles, “I get by with a little help from my friends.” The new batch is called the Referral Batch because people who pre-order through that specific Batch will have a chance to get credit applied to their account after a friend pre-orders a Crane through their link. When this happens, everyone wins as Referrers and Friends will each split the Reward ranging from $50-$100 (dependent on printer type) between them! Whether the link is sent for the Bowden, Dual or Quad, the original Account Holder can earn FitForLaunch store credit valued at $25, $35 or $50 per friend, respectively, to be used on filament, add-ons, or even an entirely new Crane printer! TO NOTE: Sharing with your personal network means sharing via email, Facebook or Twitter, for example. Link sharing will not be permitted via public forums or public chat groups, on public coupon or deal sites, etc. If links are found in these places, M3D and FitForLaunch reserve the right to cancel the program and revert any discounts or awards received. That's all for now. It's awesome to think we've gotten this far in a matter of weeks and want to thank everyone for their support and interest so far!